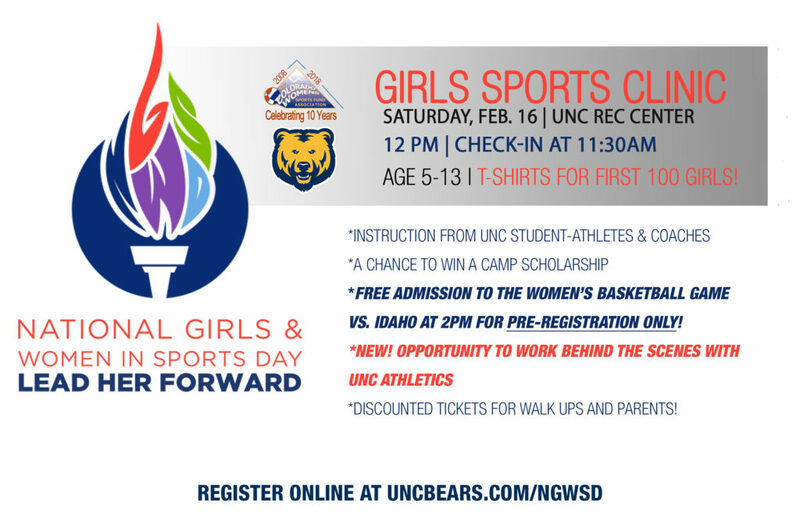 University of Northern Colorado is celebrating National Girls and Women in Sports Day on Saturday, February 16, 2019! Join us for the FREE Girls Sports Clinic (ages 5-13 years old) at 12 p.m. at the UNC Campus Recreation Center (1300 23rd Street, Greeley, CO 80639)! Check-in begins at 11:30 a.m. and the first 100 girls will receive a free t-shirt! Pre-registered participants will also receive a FREE ticket to the Bears Women’s Basketball game at 2 p.m. vs. Idaho. Walk-ups and parents are eligible for discounted tickets! **NEW this year, UNC Athletics has added multiple opportunities for select participants to be part of Bears game day by taking on various roles in sport (i.e. public address announcer, marketing assistant, cheer coach, and many more). This new opportunity focuses on the NGWSD theme, “Lean her forward,” which honors the channels available to both girls and women in sports and the endless potential to succeed. To reserve your spot, register at uncbears.com/ngwsd. A representative from UNC will follow-up with you to confirm your registration. Questions? Email athletics@unco.edu or call (970) 351 -2197.